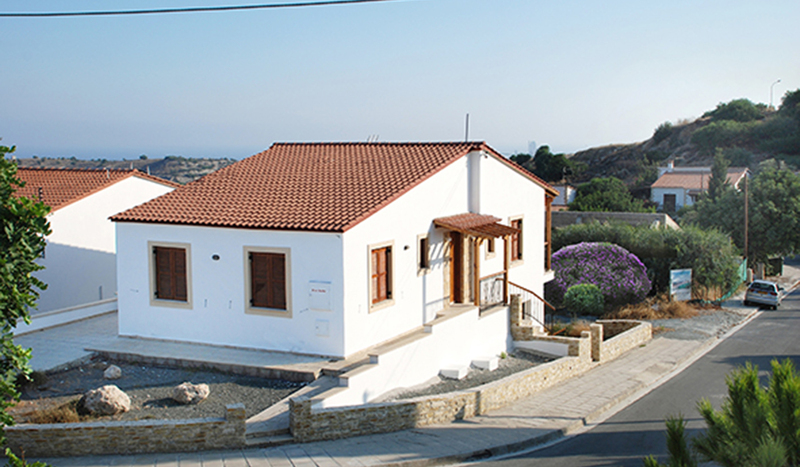 Following a careful consideration and planning, a small but comprehensive Cultural New Village with modern facilities was created, just on top of pretty traditional village of Psematismenos, called Santa Marina, under the name of the ancient renovated stone Church of Saint Marina, in the Centre of the Village. The physical elevated topography has been maintained for each Villa/House to enjoy uninterrupted sea views. Each Villa / House is of unique/individual design and built with high quality features and as customised by Homebuyer forming a newly developed Village. Care for quality and special attention to detail to each and every Homebuyer’s needs and style. Already constructed villa/ houses for immediate Sale of under constructed homes and customised villas for the most demanding Investors. Secured investment since all already constructed villa/ houses are with Title Deeds (free from mortgage), ready for transfer. The existing historical carob trees reserved and many other trees planted, so as to transform the atmosphere ‘’naturally friendly’’ ‘’Eco-Village’’. The project has been designed to grow over three separate phases, so as to give the best personal attention. Phase A, the largest has already seen the residential village take shape and form the nucleus of the project, paving the way for the smaller phases B and C (in all totaling 47 units of individual design). The great: majority of homes have been sold or are for freehold sale, few nearing completion and others under construction or custom built (off-plan), although individual purchasers are already sitting pretty. Other investment options can be considered. The success of Phase A and Phase B well under way, has given a clear boost to move ahead with Phase C.
The Santa Marina cultural village consists of one floor bungalows and split level houses matching to the elevated hillside topography providing by such the best views of the sea and foothills, backed up by private swimming pools and a communal one with full facilities. Also blending with the traditional village atmosphere of Psematismenos lower down. Along with a colourful array of flowers, plants and shrubs, making the residential area another splash of colour on a magical tableau of the heated swimming pool with kiosk / snack bar and all necessary amenities, which has started to operate as part of the AA Lifestyle Centre (Club) that will include a taverna, cafeteria, bar and library - contributing to the quality of life for existing and future residents. Buyers saw the value of their properties regaining value from the loss (due to the economic crisis of 2013) as from mid-2015 and showing further progress in 2016 and 2017, during which both local and international investments in the area of construction and real estate sales, made an amazing improvement/progress. Santa Marina individually designed villas/houses are best investment opportunity for permanent residence – holidays – buy to sell – buy to rent. best location & climate, extraordinary sea views, calm & safety. Tucked into the sweeping mountain landscape on the southern coast of Cyprus lies a pretty hillside Santa Marina, enjoying government preservation protection, half way between Larnaca / Larnaka airport and the port city of Limassol /Lemesos. Just above the cobbled streets and stone buildings of, Psematismenos village, a matching cluster of modern villas enriches the landscape, staying faithful to local character both in terms of architectural design and outstanding natural environment. The immediate environmental values of Santa Marina have been conscientiously protected, with old trees maintained and new ones planted, along with a colourful array of flowers, plants and shrubs, making the residential area another splash of colour on a magical tableau of the heated swimming pool and amenities. Santa Marina – completed houses with title deeds, under construction and customised. and the unique tranquility of Santa Marina Villas. All Residents enjoy the best location/position and lifestyle in a Peaseful- Healthy - Natural Environment. A unique hillside topography where every house enjoy uninterrupted sea view and pleasant breezes of the blue Mediterranean . Easy access to the main motorway (1km), connecting to all that Cyprus can offer at quick reach. Secured investment. The already constructed homes have title deed and houses under construction can secure title deed in logical period. Moreover all properties are free from any encumbrance. Thus Buyers are secured and have the basis to apply for a mortgage. Main facilities at short proximity (eg supermarket-groceries-bakeries, restaurants, hospital, archeological monuments). 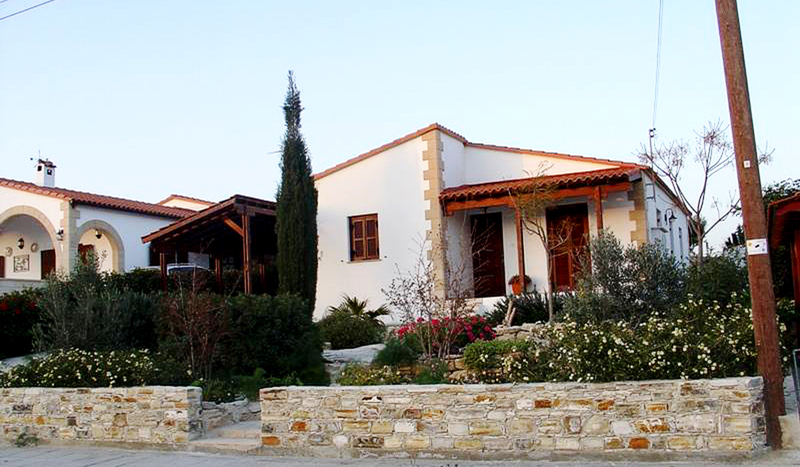 Quality construction in genuine Cyprus style feutures such as thick walls (0.30m) to meet climate conditions so that summer are cooler and winters warmer, featuring traditional elements including high sloping exposed wooden ceilings, solid wood doors, double glazing windows and shutters, iron railings, stone entrances, arches & paving and a tiled roof with extra insulation. Part of the villas front stone faced and road front fencing in natural stone and the rest in fencing walls or hedges, pergola carport , tiled patios and include central heating, solar hot water, provision for Air Conditioning. Great investment opportunity for each and every one's Santa Marina Dream Home whether bought from starting of the construction or under construction or completed with title. In addition to this all house are VAT exempted except only 2 off plan house. as well as a few golf courses, are all within easy reach. the best solution to all home buying needs and wants for freehold sale, retirement, holiday, permanent home or investment. “Wherever in the world I may travel, I always find myself longing to return to my house in Santa Marina. Here I awake to see blue skies and soak up the sunshine; to feel the soft sea breezes by day and marvel at the star studded sky by night” Jeremy Earle, Public Servant (retired). © 2017 Santa Marina Villas & Cottages. All Rights Reserved.